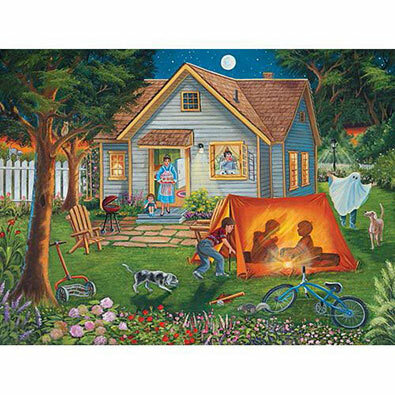 Backyard Camping is a 300 piece jigsaw puzzle designed by artist Christine Carey. The neighbourhood boys are camping in the backyard tonight. A tent is set up and they are telling stories by flashlight. Bikes are parked on the lawn and the dogs are sniffing around while mom brings snacks into the yard for them to enjoy. Available in three-piece counts. This 300 large piece jigsaw puzzle is designed by Sandy Rusinko and measures 45 cm x 61 cm. This puzzle presents a busy boardwalk, complete with attractions and treats. People flock down to the beach to enjoy the cool water on a summer day. Available in three-piece counts. This 300 large piece jigsaw is designed by Brooke Faulder and measures 46cm x 61cm. Available in two piece count. Larger than usual puzzle pieces may be easy to handle, but don't be fooled. These beautiful puzzles are still exciting and challenging to put together. This 300 large piece jigsaw puzzle is designed by Lynne Jones and measures 46 cm x 61 cm. A bunch of bunnies gather together in a pile of hay to eat veggies near a sleeping kitty. This 300 large piece jigsaw is designed by Kay Lamb Shannon and measures 45 cm x 61 cm. All cars are welcome to pull into this friendly gas station for all of their travel needs. Available in four-piece counts. This 300 large piece jigsaw is designed by Ruane Manning and measures 46cm x 61cm. Available in two piece count. Available in two piece count.